In an area of Pennsylvania called The Big Valley, a uniquely blended Amish community thrives in which 3 distinct groups of Amish identify themselves by the colors of their buggy’s top—white, black, or yellow. 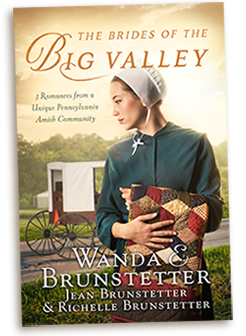 Join New York Times Bestselling Author Wanda E. Brunstetter, her daughter-in-law, and granddaughter in experiencing the stories of three young women who search for faith and love within this special place. Deanna is a widow who sees her second chance of love slipping away. Rose Mary is at a point in life where she must choose the path of her faith and the right man to walk with her on it. Leila is burdened with family responsibilities and wonders when she will ever start a family of her own. Copyright © 2019 Jean Brunstetter All rights reserved.